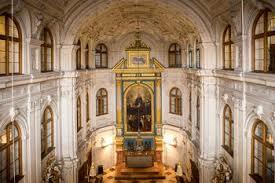 Enjoy our most popular concerts in the old court chapel of the Residenz. You will be enjoying musical works from Vivaldi, Albinoni, Bach, Haydn, Mozart, Beethoven and many more. It doesn’t matter if you are an admirer of classical music or a newcomer, this concert played by our acclaimed Residence-Soloists will fascinate you. The old court chapel is heated. You can combine your concert experience with a visit of the entire Residence including the Cuvillies-Theatre and the hidden treasures of the old kingdom. The visit includes an audio-guide. A Bavarian menu with optional beer tasting. The Residence Soloist including players of the Munich Philharmonic Orchestra are mainly performing works by Vivaldi, Haendel, Mozart, Haydn, Beethoven etc. You can further combine this concert experience with a visit of the entire Residence including the Cuvilliés-Theatre and thus indulge your eyes with the hidden treasures of the old kingdom. The visit includes an audio guide. * The tour of the Residence is available 2 days prior to and 5 days after the date of the concert. Please note that visiting the Residence directly following the concert is not possible. The Residence Soloist including members of the Munich Philharmonic Orchestra are mainly performing works by Vivaldi, Haendel, Mozart, Haydn and Beethoven etc.